CUHK Professor Leung Kai-chi has created a map showing the median monthly income of households living in housing estates located at each MTR stop. 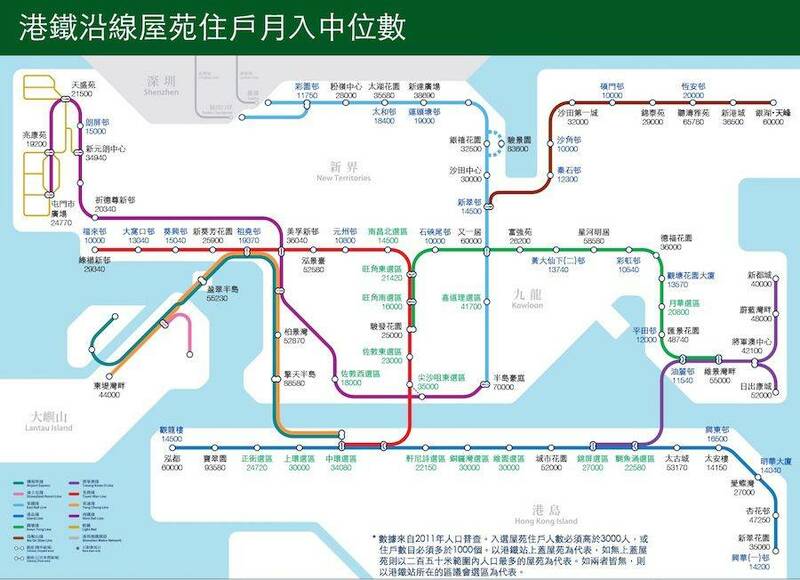 Leung, who shared the map yesterday on his Facebook page, wrote that someone recently told him that "in Hong Kong, it's not easy to get by while making HKD30,000 a month – but making HKD30,000 a month is already not bad". From Shek Mun Estate on the Ma On Shan Line, where half of the households earn less than HKD10,000 a month, to the Belcher’s at HKU Station on the Island Line, where half the households earn more than HKD93,580 a month, Hong Kong’s inequality is clearer than ever – unless you’ve ever walked outside with your eyes open. Using 2011 census data, Leung thus created this map showing the median monthly income of households living in estates that have more than 3,000 people, or house more than 1,000 families. Residential complexes in black font are either private housing estates or subsidised ones that are available for sale. Those in blue are rent-subsidised estates, while those in green represent district council constituencies. Explaining that the map only shows median incomes, Leung adds that there is therefore no way of knowing just how much higher than the median some households earn. "Regarding Hong Kong's wealth disparity, you may say you don't understand the Gini coefficient, but if you just look and see how some areas are earning several times more than others, then it will become quite clear," Leung wrote.